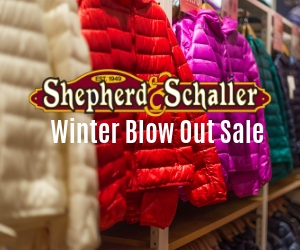 The outdoor lifestyle is more than a trend at Shepherd & Schaller, where recycling and repurposing is in our soul. Maybe you’ve visited our home in an 1800s building, seen our cozy sales floor decorated with historic artifacts and sporting gear, a current trend yet a style we’ve always embraced. Waste not, want not! 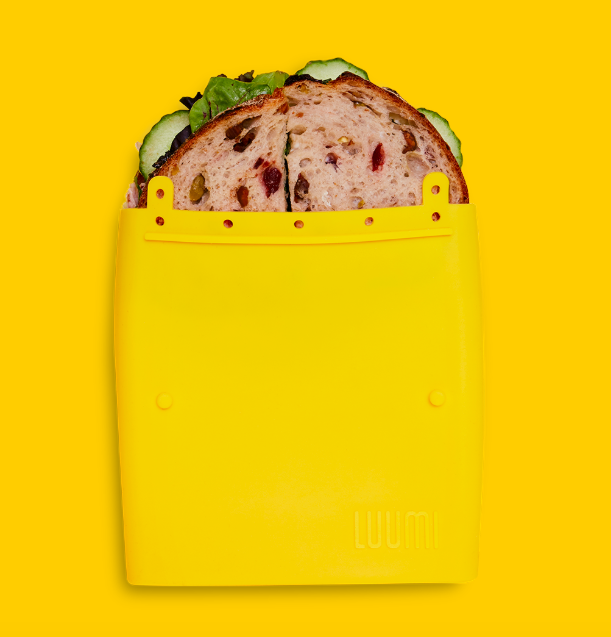 Luumi Silicone Storage – Yes! Perfect for almost any kind of food. It’s dishwasher, freezer, microwave and oven safe. It even makes a great sous-vide cooking utensil, where you immerse food in warm water. 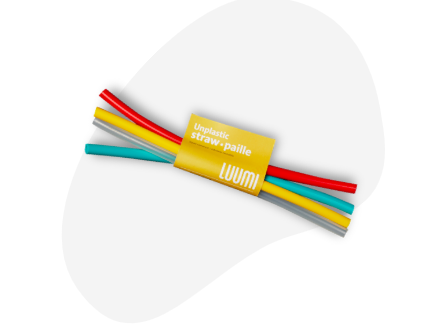 Luumi silicone is found in green-conscious homes everywhere. Come check out the straws, bags, bowls and lids we stock. 100% platinum silicone lets you leave the bad out and keep the good in. Author tshepherdPosted on March 16, 2019 March 19, 2019 Categories UncategorizedLeave a comment on When you care about the Outdoors, it’s part of your Indoors too. Luumi can help. Bet you were thinking about nuts and bolts. Sorry, we’re thinking about one of our resident cyclists. Meet Brad. Brad would live on a bike if he could. (His wife and new sweet baby girl would probably have an issue with that, so he doesn’t!). He loves to mountain bike. It’s his favorite hobby. He loves the freedom. He loves the challenge. He loves the dirt! And in the winter, he loves fat tire biking. When temperatures drop and snow falls, a lot of people give up on doing the things they love to do outdoors. Not Brad. He puts the mountain bike away and gets out the fat tire bike instead. The thrill of riding a bike on snow is unlike anything else. The silence. The whiteness. The feeling of taking on nature in her winter cloak. Fat tire bikes, with an off-road frame and oversized tires and rims, are designed for low ground pressure to allow riding on soft, unstable terrain, like snow, sand, bogs and mud. 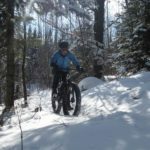 His fat bike gives Brad the opportunity to continue his favorite hobby in Central Wisconsin’s winter wonderland at Nine Mile Forest or the Underdown in Gleason (to name a few.) No amount of snow is going to stop him! He says it also teaches him better handling skills for summer mountain biking. 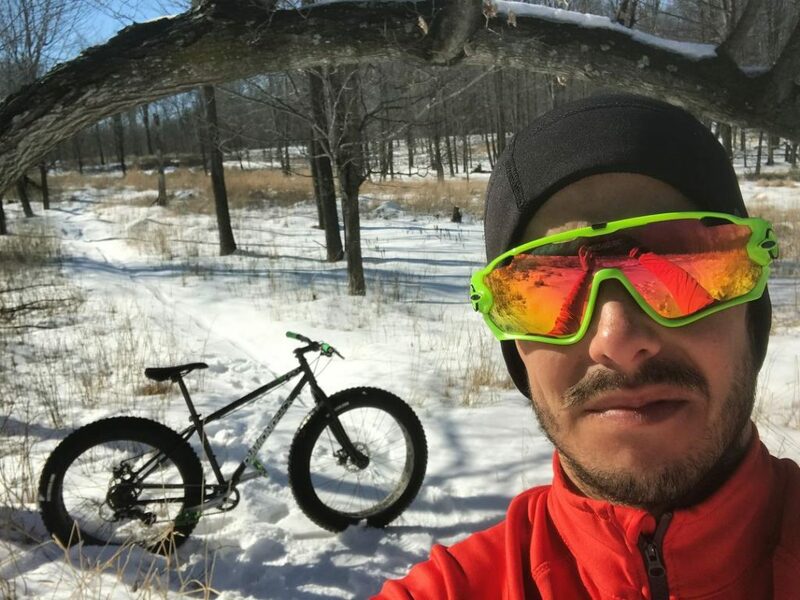 Within the Wausau area, his other favorite places to ride are the Big Eau Pleine in Mosinee, the Ringle Trails (obviously in Ringle) and the Prairie Dells, also in Gleason. All of these locations are groomed and are within a 30-mile radius of Wausau. Brad may not be a bike nut after all. So come into Shepherd & Schaller and talk to Brad and to our other bike nuts. Ask questions. Tell us your biking stories, the nuttier the better. And while you’re here check out our Scott and Raleigh bikes. 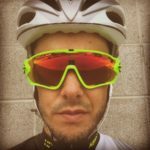 Author Laura KurthPosted on March 6, 2019 March 19, 2019 Categories Bikes & Biking in Central WI, UncategorizedLeave a comment on What does a bike nut look like? Meet Brad. You slipped on a banana peel and ripped your pants when you fell. It took a lot of tries to master that Half Cab Mute Grab and you have a cracked ski edge to show for it. Your daughter shut the car door on your new jacket and now the zipper is broken. Oops! That’s ok, you’ll get a new one under warranty, right? Sorry, you likely won’t. But if said pants, jacket or ski has a manufacturer’s defect in materials or workmanship within a limited time period it’s a different story. 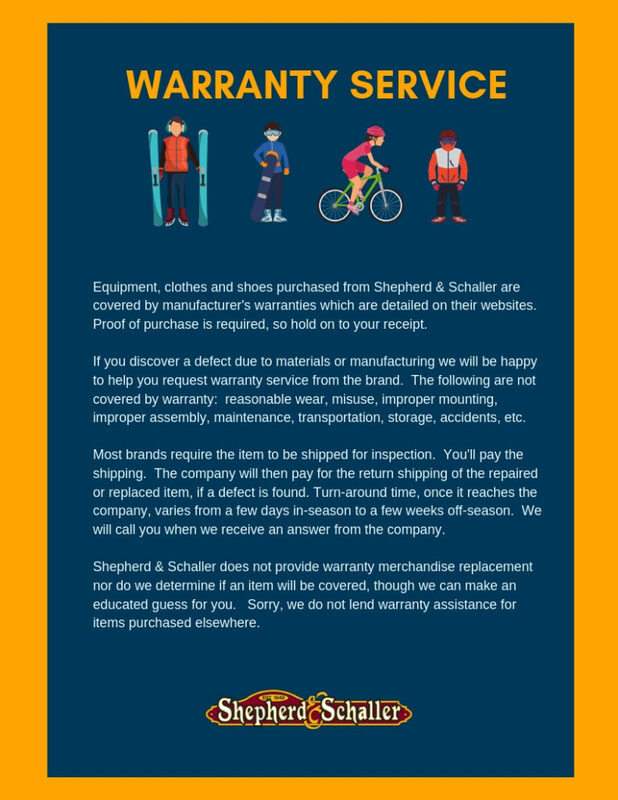 The good news is we’ll help you through the processes of requesting warranty repair or replacement. Another benefit of shopping at Shep’s! 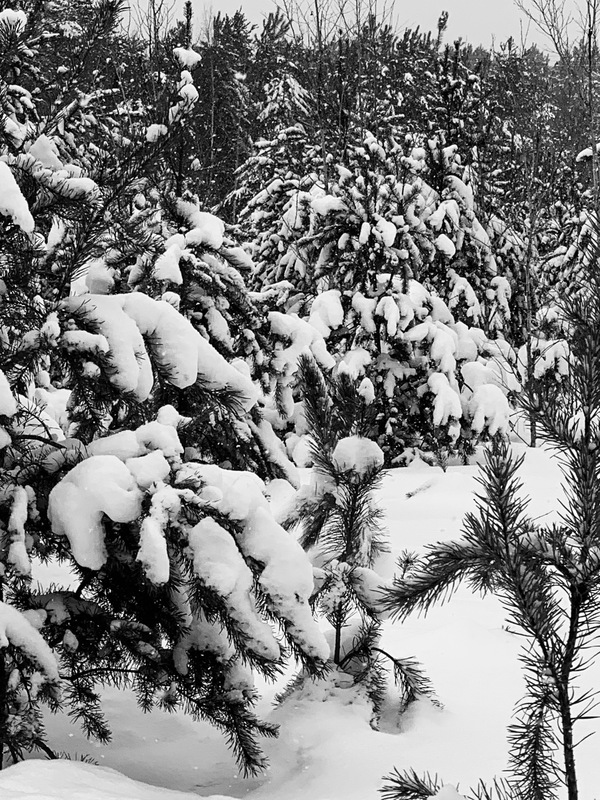 One of the most beautiful sights in winter is trees with freshly fallen snow. The Pine. The Spruce. The Maple. The Birch. All decorated with the intricacies of the snowflake. The silence echoes the beauty of nature’s call to us. 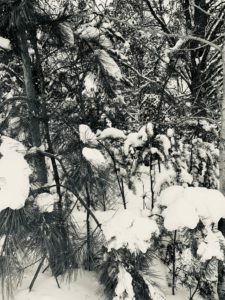 Our forests have been an integral part of Wisconsin history reminding us that time passes around us as quickly as the winter wind. Sometimes we forget how lucky we are in Central Wisconsin to enjoy the many types of trees that we have. We take for granted what trees have done for our lives – from logging to conservancy, from building to planting. Trees continue to reign over our lives. 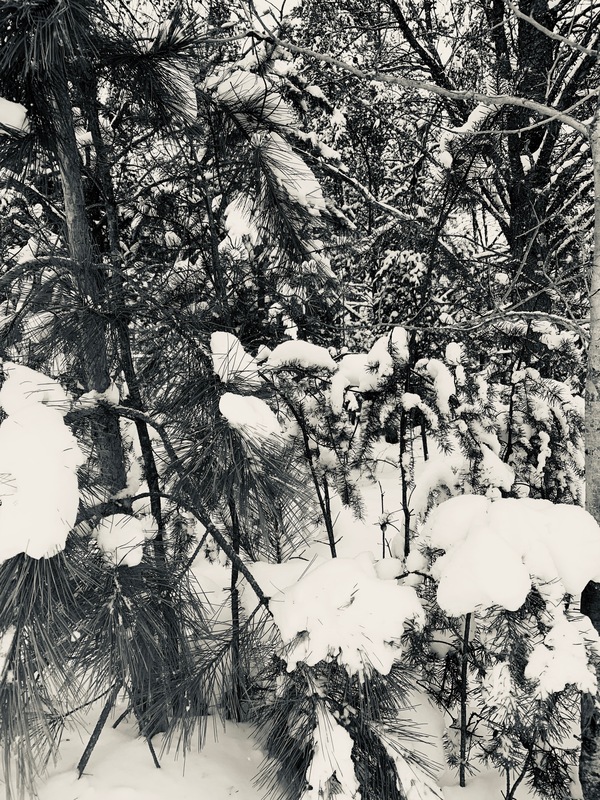 When we travel through the winter forests, we are passing not just through the trees but through a wonderland of beauty and communities – from the trees themselves to the animals they shelter. Skiing or snowboarding through the trees provides an opportunity to enjoy their majesty. Snowshoeing on a winter’s eve with a full moon is breath taking. Having the opportunity to enjoy such a playground is a blessing, one to enjoy and one to protect. We here at Shepherd & Schaller salute the trees. We embrace the winter wonderland they provide. We encourage everyone to go out and smell the crisp air, listen to the song playing in their wind-blown branches, whisper back to them all of your secrets and wishes. They will guard your secrets well. The forests beckon to us. They call our names. They are part of us. They are one of the many reasons we do what we do. We are here to encourage everyone to enjoy the outdoors and the trees as we do. We are here to assist in your journeys. We are here at Sheps to gear you up and send you on your journey. We are here because of the trees.